On 7 March 2018 came a major announcement in the world of architecture. For the first time in its 39-year long history, the Pritzker Architecture Prize, often referred to as ‘the Nobel Prize for Architecture’ was conferred to an Indian architect. Born in 1927, in Pune, Balkrishna Vithaldas Doshi, simply known as Doshi to most people, was awarded the prize for his lifelong commitment to the practice of architecture as well as to education. In a career that has spanned more than sixty years, including projects across the board, from single-family houses to townships, and institutions and cultural buildings of national importance, Doshi’s work has been instrumental in shaping the discourse on architecture not just in India, but globally. Through his designs, writings and teachings, as well as his ability to work across income-groups, Doshi’s work has, as mentioned in the jury citation that accompanied the award, “touched lives of every socio-economic class across a broad spectrum of genres since the 1950s”(1). However, despite his prolific oeuvre, Doshi has remained – at least up till now – a relatively unknown figure outside of his native India. In fact, in the West, many architects would struggle to name more than a couple of his buildings, and most would probably know him best for his close association with two of the 20th century’s most well-known architects: Le Corbusier and Louis Kahn. But what do these oversights represent? In a world dominated by jet-setting star-architects, glossy renderings, and PR teams, how can one situate the work of a veteran like Doshi? For starters, at nearly 91 years old, Doshi is the oldest recipient of the Pritzker Prize. The long wait for such recognition for him or many of his colleagues, points to the fact that up till recently, mainstream architectural media have largely ignored movements in architecture that have blossomed and grown in much of the Global South. Barring Oscar Niemeyer from Brazil, Luis Barragán from Mexico – and to some extent – Charles Correa, another towering figure from India, students of architecture around the world have little knowledge or access to the works of architects from Asia or Africa. And while things are changing, evident with the rise in popularity of the work produced by the offices of Bijoy Jain (Studio Mumbai), Diébédo Francis Kéré (Kéré Architecture) or Alejandro Aravena (Elemental), among others, the West often ends up typecasting these architects as “regionalists” or as “architects of the poor”. Seldom do we look at their work through the same lens as we do for many of their Western counterparts. But in fact, Doshi’s work, while rooted in India, holds values that are applicable anywhere. It is in these principles that underlie his work, and not just their final material expressions, that we can all learn from. Tracing an arc over his long and distinguished career, it is clear that Doshi is a product of both local and foreign influences. Starting with his earliest memories of living in a large joint family house in Pune, recollections of family life, as well as living in an old town inculcated in him from the very beginning the belief that “buildings are critical instruments for celebrating life”(2). Showing aptitude for art and architecture at a young age, Doshi enrolled for architecture studies at the well-known Sir J.J. School of Architecture in Mumbai. With ambitions to appear for the Royal Institute of British Architects (RIBA) examinations, Doshi boarded a ship bound for England in 1951, where a chance encounter with Corbusier in London landed him a job as a young apprentice at the latter’s atelier in Paris. Knowing no French, and in a land completely alien to what he was familiar with, it was those crucial years at Atelier 35 rue de Sèvres where Doshi learned the ropes under Corbusier’s watchful eye. “Le Corbusier didn’t pay me for eight months, I had hardly any money,” he says in the 2009 documentary ‘Doshi’ about his life. “Eight months with olives and cheese and bread, that’s all.”(3) With the building of Chandigarh on in full-swing, Doshi relocated to India in 1954 to oversee the construction of several of Corbusier’s projects in the country. These included, among others, the High Court in Chandigarh (1952-56), as well as the Mill Owners Association Building (1951-55), Villa Sarabhai (1951-55) and Villa Shodhan (1951-56), all located in the western Indian city of Ahmedabad. It was there in Ahmedabad where Doshi finally decided to settle. 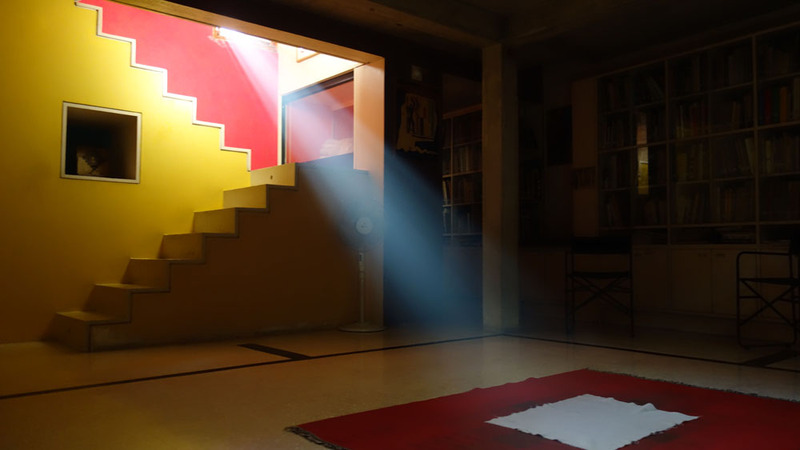 Encouraged by the patronage he saw in the city, a young Doshi decided that Ahmedabad provided the fertile ground to leave Corbusier’s office and start his own practice Vastushilpa in 1956. But perhaps due to his close association with the Swiss-French architect, Doshi’s first works exhibit – even more so than his contemporaries – a strong Corbusian influence. The Indian Institute for Indology (1957-62) in Ahmedabad is one of Doshi’s first public buildings. Designed to house ancient manuscripts, a research centre, and now a museum, the predominantly exposed concrete structure carefully executed in powerful sculptural forms recalls Corbusier’s 1952 unbuilt proposal for the Governor’s Palace in Chandigarh. Yet, upon closer inspection, one can find in Doshi’s work an attempt to break-away from his master. Unlike Corbusier’s stand-alone brise soleil, Doshi reinterpreted this element in the form of a verandah – a typical feature found throughout the geographies of warm climates. And instead of the pilotis, a raised plinth recalls the architecture of Jain temples one can find in Ahmedabad. It is this marriage of western and eastern influences that best characterizes much of Doshi’s work. In the design for Kamala House (1958-63), his own private residence in Ahmedabad, one can again find a blend of modernity and tradition. Not seen as opposites, the organization of the house and its material form take cues from living in the sub-continent, with Doshi preferring intimate spaces as opposed to grand scales, and low-cost materials like brick and Kota stone over steel and glass. 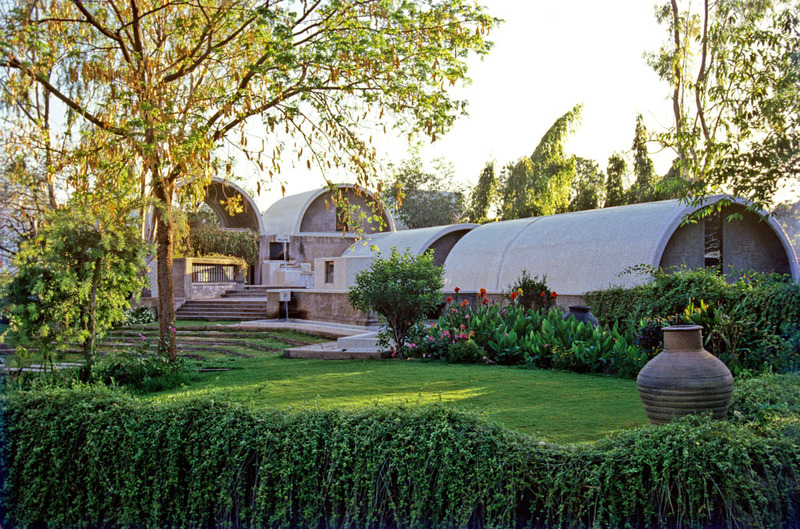 This is evident not just in his designs for a small family house, but even in the design for one of his most well-known projects: the campus for the School of Architecture in Ahmedabad (1966-2012) for which he was also its founder-director. Known today as the Centre for Environmental Planning & Technology (CEPT), the campus relies on a similar material palette as the one used in Kamala House, but here the use of brick is maximized, extending also to the large open terraces, plinths and stairs across the campus. With its buildings cleverly orientated to the sun, minimizing heat gain, large free-flowing covered spaces that blend the inside and outside create numerous spontaneous places to meet, and are all but another example of Doshi prowess for creating architecture that is climatically, culturally and economically suited to its context. However, here it becomes important to mention Louis Kahn, another key mentor who also shaped Doshi’s work and thinking. In 1961, when the Government of India sought to establish the second Indian Institute of Management (IIM) in the country, it was Doshi who recommended that Kahn be invited to design the campus in Ahmedabad. Choosing to play the role of an assistant until Kahn’s death in 1974, this initiative showed, yet again, Doshi’s desire to learn. 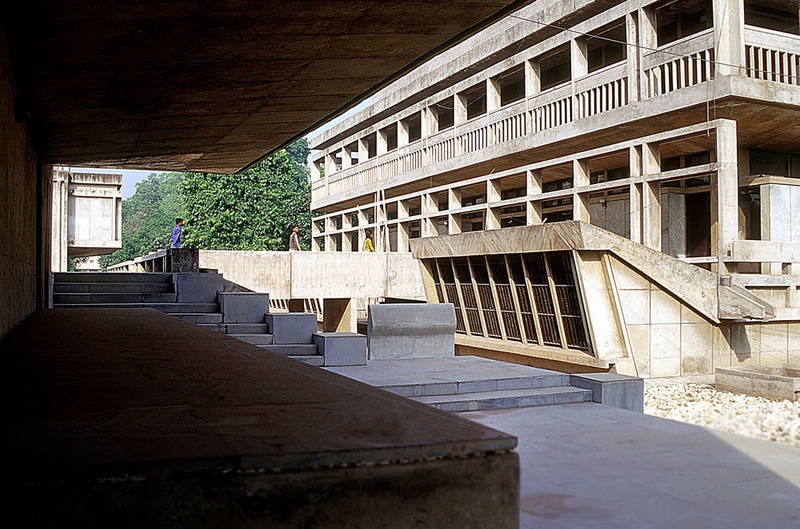 In many ways, one could argue that Doshi’s designs for CEPT are a synthesis of what he learnt from both Corbusier and Kahn, but tempered to reflect and suit Ahmedabad’s culture, climate and landscape. 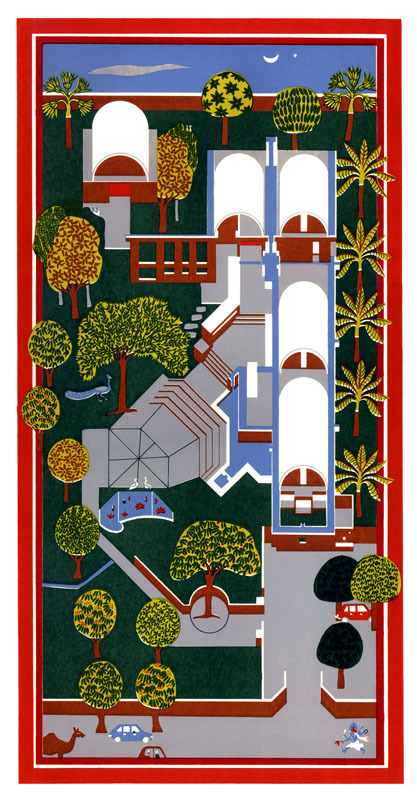 Soon after, in 1977, Doshi would get his own commission to design a campus for the Indian Institute for Management, this time in the southern Indian city of Bangalore. Here, Doshi’s maturity as a designer is on full show. 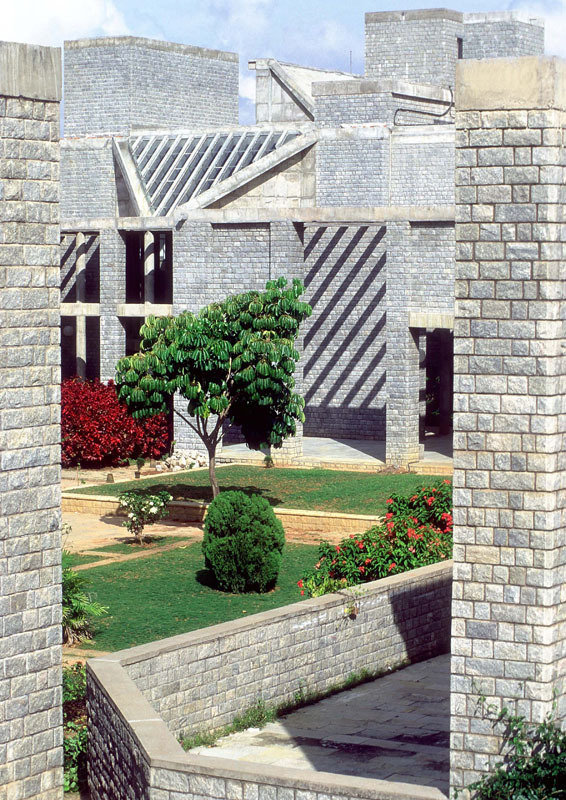 By making a reference to the maze-like configurations found in old Indian towns, temples and palaces, an interlocking arrangement of buildings, courtyards and galleries composed in a fresh vocabulary of concrete and local stone creates a variety of spaces that, while open, are protected from the hot sun. 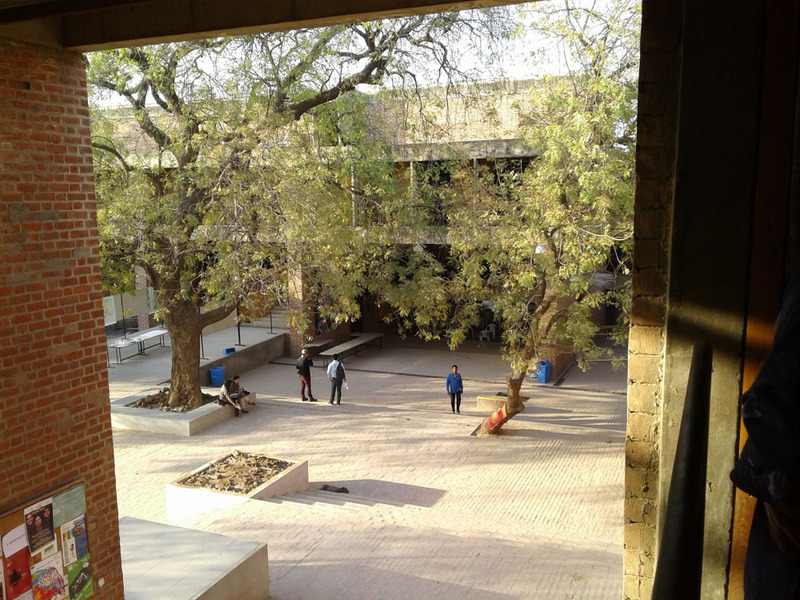 Like in the campus for CEPT, people are invited to interact with the landscape as they move through the campus, setting up yet again, spaces for interactions and informal meetings. 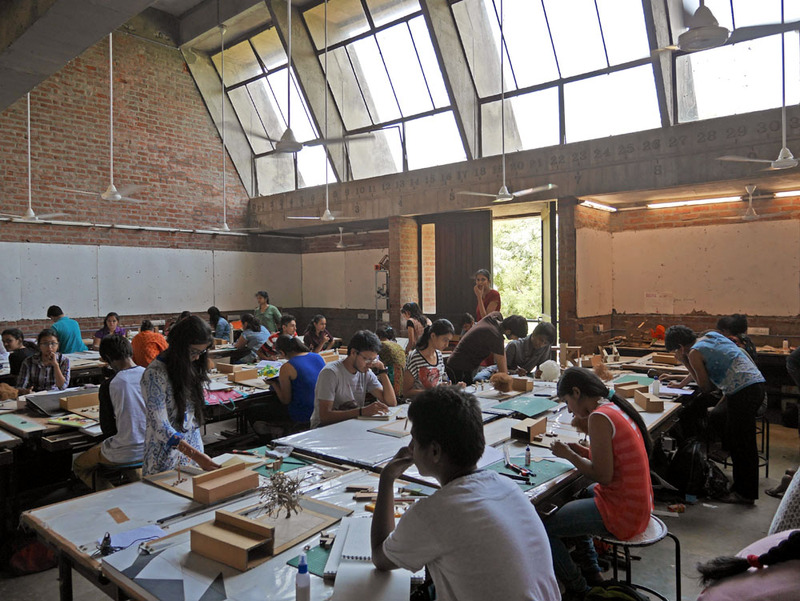 Undoubtedly, the experience of designing and building three major campuses influenced Doshi when in 1980 he set out to design a studio for his own architectural practice. Sangath, which in Sanskrit translates to “moving together”, has served as Doshi’s studio ever since, and while it was designed to accommodate roughly 40 people at the most, it feels more like a campus rather than an office. Regarded by many as Doshi’s most beautiful building, Sangath is a masterful arrangement of gardens, pathways, water bodies and enclosed spaces that give the feel of an urban oasis from the moment one enters the compound. 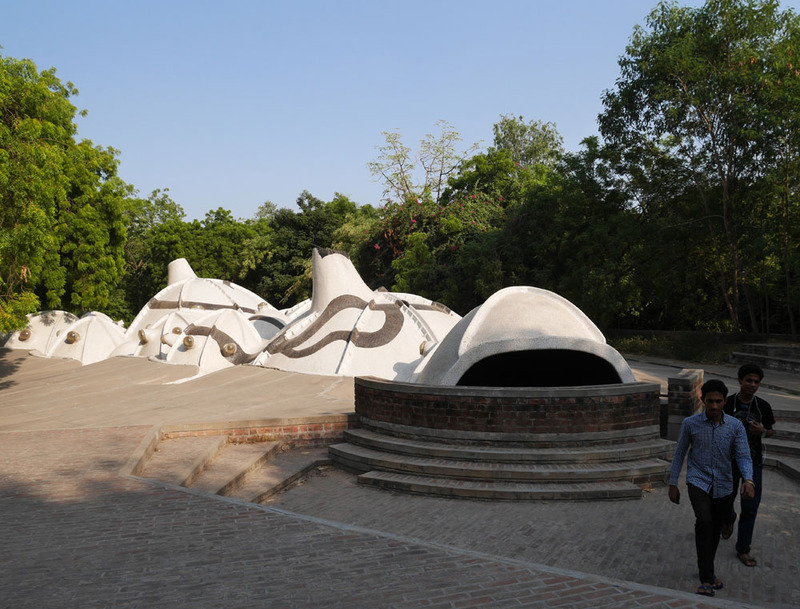 The building itself, partly sunken in the ground, consists of a series of vaulted roofs covered in recycled porcelain mosaic tiles that help mitigate the extreme heat of Ahmedabad. This detail can be found again in two other projects in the same city: the Gandhi Labour Institute (1980-84) and Amdavad ni Gufa (1994) – an incredible cave-like ferrocement art gallery that was born out of a collaboration between Doshi and the Indian painter Maqbool Fida Husain. But perhaps more than any of his institutional buildings or private commissions, it will be Doshi’s work on public housing that will have the most lasting impact on India’s urban landscape. The parallel terraced houses for ATIRA in Ahmedabad from 1957 and the Life Insurance Corporation Colony, also in Ahmedabad, from 1973 are testament to Doshi’s commitment towards building humane and affordable housing for many of the country’s have-nots. 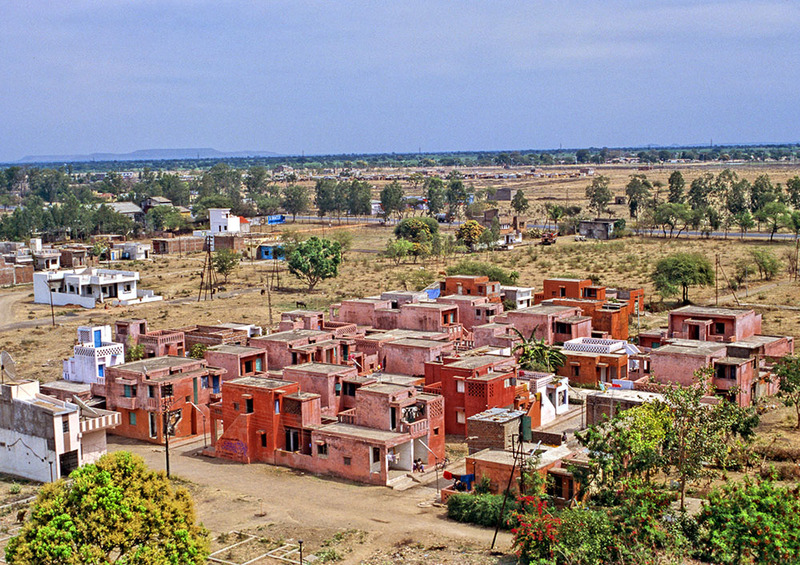 However, it is his Aranya Low-Cost Housing project in Indore, for which he won the prestigious Aga Khan Award for Architecture in 1995, that best describes his ideas for low-income housing and incrementality. Designed in the 1980s, and funded by the World Bank, Aranya is representative of Doshi’s belief that architecture must allow for growth and change. Designed to eventually house a population of 60,000 people in some 6500 dwellings across 85 hectares(4), Doshi’s master plan included a labyrinth network of roads, pathways and open spaces, and a variety in the type and size of plots available to different income groups. However, apart from providing a detailed master plan, Doshi’s office was also responsible for designing and building 80 demonstration houses, with the intention that future residents of this site could learn and educate themselves about the possibilities of each of their individual plots. Today, Aranya has grown to resemble a typical Indian town where narrow streets are shaded by a variety of houses, ranging from ground storey dwellings to even three-floor high urban townhouses(5). Projects such as Aranya have since cemented Doshi’s position as one of the pioneers of low-cost housing, something that he is acutely aware of. 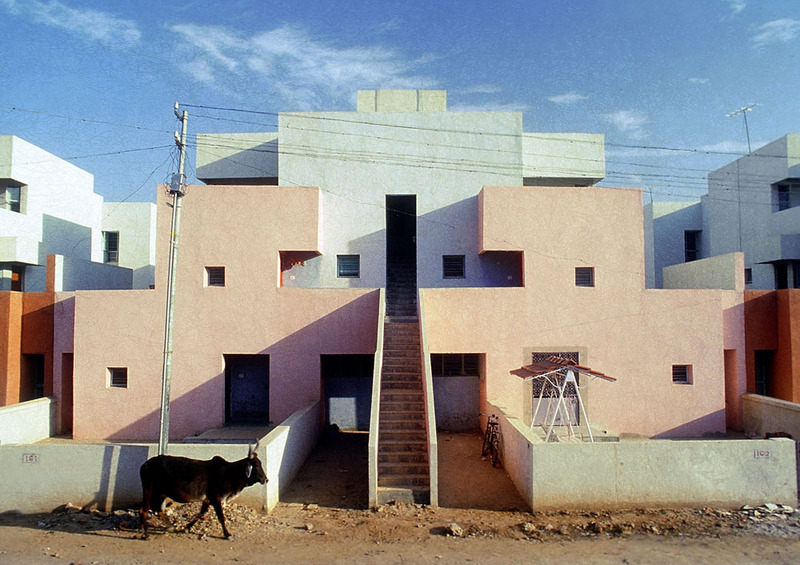 Ever since the announcement of the Pritzker Prize, Doshi has used his platform to remind us, not just in India, that “the architect is at the service of human society”(6) and that the building of a humane habitat for all should be our primary concern. It is thus well deserved that this year’s Pritzker Prize, although late, be given to one of architecture’s oldest students. However, when one looks out of a window in Mumbai or Lagos or Bogotá, what relevance do awards like the Pritzker even have? After all, no architect, however influential, can single-handedly change the course of development in a country or even a city. And given that much of the world today is dominated by market forces, even matters such as the building of affordable housing now lie primarily in the hands of the private sector. Gautam Bhatia, an architecture critic from New Delhi, in a recent interview lamented on the degraded role of the architect in India today. “The housing is insufficient, the infrastructure is insufficient. When you have these problems, is it even ethical to worry about design?”(8) He asks. The answer to his question might as well lie in a study of Doshi’s life and work. Although the economic and political context has changed, Doshi has throughout his career worked to expand the role of the architect, through the design of buildings, writings and teachings, showing us in the process, clues to the way forward. And while he remains an Indian architect, his work has shown that each society must constantly seek to develop their own architectural expression, and be shaped by forces such as climate, culture, materials, technology and aspirations. Like the work of several of his generation, whether that is Charles Correa in India, Fumihiko Maki in Japan, or Glenn Murcutt in Australia, Doshi’s oeuvre reminds us what an architect ought to be. Rohan Varma is an architect and researcher based both in Mumbai and Amsterdam. He currently combines his work as the Principal Architect of IND with his work at the TU Delft where he is a doctoral candidate, tutor and researcher.